It was in a good location with a nice pool & great views. Also, very close to town & ferries. They also had very nice music around the pool & public areas. Trust me, if you book this hotel you will not be disappointed. This was one of our favorite places on our 14 day travels around the Greek Islands. Vassilis and his daughter Iliada were the warmest hosts ever! The hotel is in a perfect location, super close to the port and town but on the edge of the cove so it’s quiet and has a lovely view. We rented an ATV and explored the island (you need an international drivers license to do so) but every afternoon we would come back to the hotel, enjoy a few beers and the pool. Very relaxing, especially with the addition of Vassilis’ amazing playlists! We had a lovely breakfast here on our last day and really did not want to leave! I would very highly recommend staying here if you have the chance! The view was fantastic! The convinience of having a oven/cooker was great. The size of the apartment was really good and the staff ever so friendly. Rooms were modern and clean. The pool and restaurant had a great view on the harbour. All within walking distance! Staff were extremely friendly and accommodating. Nice and relaxed atmosphere. Nice staff and close to the town. The staff were wonderful. Very friendly and accommodating. Always offering us lifts to the ferry port to Paros with our bags, even though it was walking distance. Hotel is in a great location, walking distance to loads of great restaurants and shops and the ferry port to Paros. The room was very clean and comfortable. The pool looked very inviting but sadly the weather wasn't great during our stay so we didn't get a chance to use it. * Warm welcome and friendly, first class service from Iliada and her staff: small issues soon ironed out. * Vassilis' music choices provided the perfect background soundtrack at the pool. * Great views from the rooms, from the pool and from the cafe. Lovely garden alongside the pool. * Perfect location on the edge of the village so only a short walk to shops, restaurants and all amenities yet Kouros Village was a quiet, peaceful place to be. We LOVED our stay at Kouros Village. 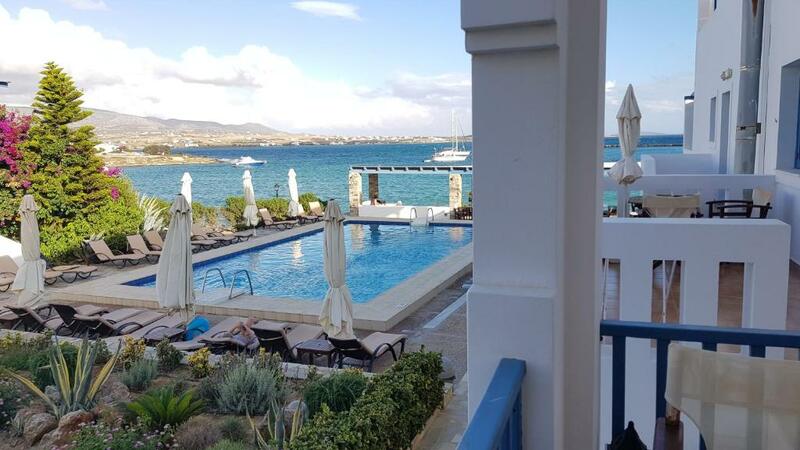 Everything was superb - amazing location overlooking the very pretty bay of Antiparos, stunning newly renovated room (very comfortable with lots of space and beautiful view from terrace), and incredibly friendly staff who were helpful and warm from start to finish. Looking forward to coming back! Lock in a great price for Kouros Village – rated 9.5 by recent guests! The air-conditioned rooms come with a TV and balcony with views of the Mediterranean Sea. The dining area comes with a fridge and electric kettle. Featuring a shower, the bathroom comes with a hairdryer. Breakfast, lunch and dinner are available a la carte and offer a variety of fresh and local products with an emphasis on Greek and Mediterranean cuisine. Babysitting services are available upon request. Kouros Village is 1,650 feet from the Port of Antiparos where guests can choose among numerous cafeterias, bars and tavernas. The nearest beach is just 150 feet from the property. The owners can help with boat rentals. 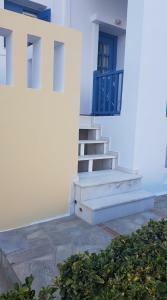 When would you like to stay at Kouros Village? This air-conditioned apartment comes with a balcony with views of the Mediterranean Sea. A fridge and electric kettle are included. Featuring a shower, the bathroom comes with a hairdryer. This air-conditioned studio comes with a balcony with views of the Mediterranean Sea. A fridge and electric kettle are included. Featuring a shower, the bathroom comes with a hairdryer. The air-conditioned suite comes with a TV and balcony with views of the Mediterranean Sea. The dining area comes with a fridge and electric kettle. Featuring a shower, the bathroom comes with a hairdryer. There is also a living room with a sofa bed. Kouros Village is a home away from home. It has a relaxed environment and strives to offer the best personalized service to our guests. 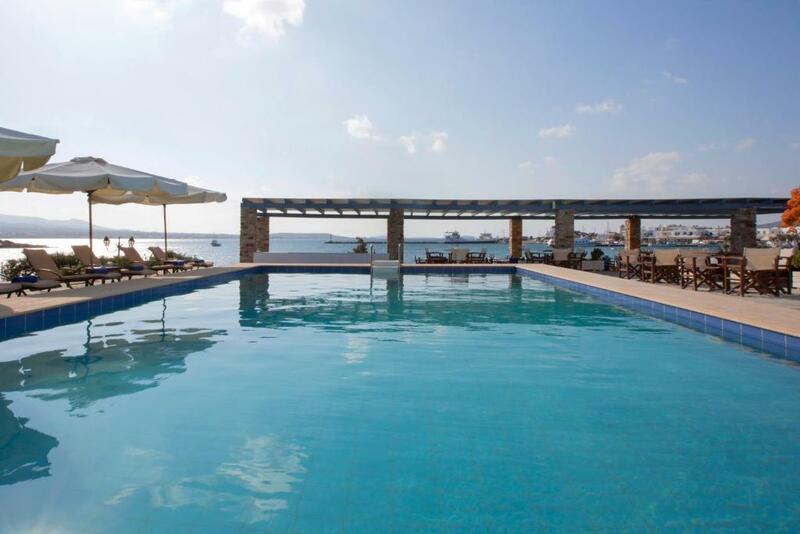 It has great views over Antiparos harbour, a pool, a restaurant; everything you need to wind back and enjoy your holidays. I am Iliada and you will find me online and onsite most of the time of the day! You can speak to me in Greek, English, Swedish or Norwegian! Maybe a bit Italian and Spanish too but then we will have to be creative! Kouros Village is located at the end of Antiparos harbour. It is a quiet neighborhood with great views over the ever changing port; the ferry boats crossing over to Paros, the kite-surfers doing their tricks and the people walking by. There is always a nice breeze, essential for the hot summer days! Just a few minutes’ walk from the hotel and you are in the vibrant village which is full of restaurants, cafes and shops. The beach of Ag. Spiridonas is just a minute's walk away while other beaches such as Sifneiko, Psaraliki and the camping are also walking distance. House Rules Kouros Village takes special requests – add in the next step! Kouros Village accepts these cards and reserves the right to temporarily hold an amount prior to arrival. Our stay at Kouros Village was made even better because of the warm and friendly atmosphere created by the wonderful family and their staff at the hotel. We had a challenging start to our holiday in that we could not get the ferry connecting Paros to Antiparos due to adverse weather conditions which resulted in us missing the first night of our holiday reservation. Christos was extremely reassuring and kept us informed by email with regards to when the ferry would be recommencing the crossings. There was a large number of us due to stay at Kouros Village because we were due to attend a family wedding and yet Kouros Village did not charge us for the night that we could not check in. This kind gesture was not lost on any of us because I am confident that this would not be the case everywhere. The family go the extra mile and were happy to offer lifts to the wedding venue when the mini coach that had been arranged to transfer us to and from the wedding venue was unable to get to Antiparos again due to ferries being cancelled. 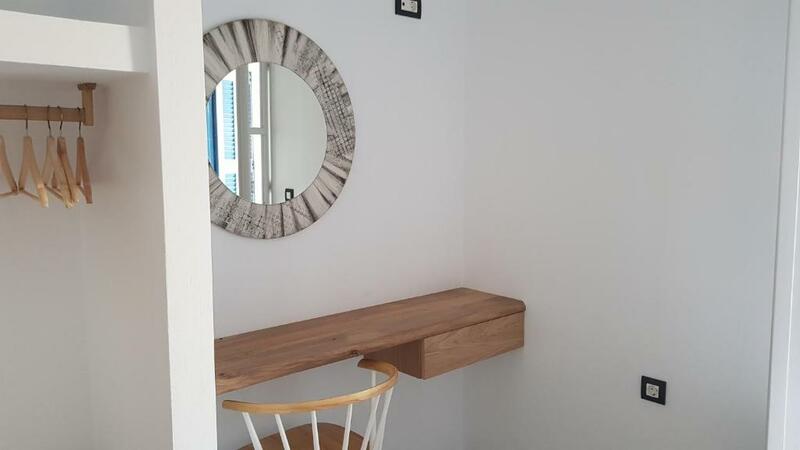 Our apartment has been recently refurbished, it has been done to a good standard,it was bright, clean and tastefully done, the bed and pillows were comfortable with linen and towels changed on alternate days. The air conditioning is really quiet and easy to operate so that you can manage to get a comfortable temperature in your room and not be disturbed by the noise. Kouros Village is situated at the far end of the harbour however it is close enough to the beach, local shops, restaurants and bars without all the hustle and bustle. 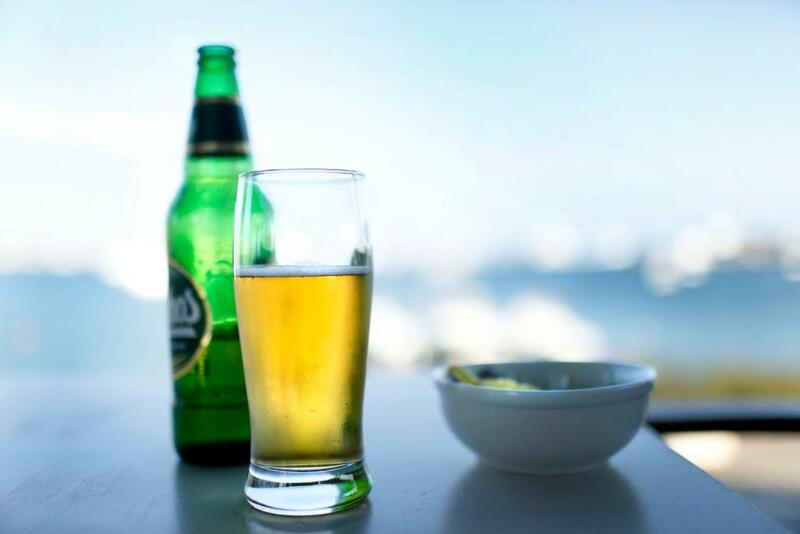 The hotel has a wonderful view over the harbour which we could enjoy from our verandah, sitting by the pool or while enjoying a relaxing drink at the outside dining area. Nothing is too much trouble and when I asked whether there were any playing cards that we could use Christos had a look of “but of course we do”, only to return with a full poker set. I would highly recommend Kouros Village for a holiday. The Air conditioning wasn't very powerful. Complimentary water would have been good on arrival as the tap water isn't very drinkable. However they sell water in reception and there are plenty of shops nearby. Could have used an electric kettle. We had a wonderful time . Room perfect fabulous view . Perfect setting next to the sea and lovely swimming pool .Staff very helpful through out our stay . We will be returning next year !! Open shower leads to water splashing on floor (common problem in Greek hotels). Fantastic stay, the staff (Christos and Liada) were brilliant hosts. They went out of their way to make us feel at home. Big, spacious rooms. The location is fantastic, 2 minute walk to the restaurants in town and the beach. Excellent clean pool with ample loungers. We will definitely return. The Wi-fi was poor, but this meant more relaxation! The staff were super friendly and the little beach right by the hotel was calm, shallow and warm like a bath. Would be perfect for children. Rooms and bathrooms could do with a little updating, feels and looks a little tired. If this was done then the place would be perfect. Staff were very friendly, food was excellent. Great location which is very close to the port, beach and town. Nice swimming pool which is an added extra. I should have stayed longer! !